Past FFT Participants are Swimming FAST! Earlier in December of 2017, the fastest 18 & under swimmers competed at the East and West Winter Junior Nationals. 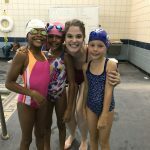 Many participants at these highly competitive meets have been participants at Fitter and Faster Swim Clinics and Camps over the years. These elite level age-group swimmers are demonstrating a level of inquisitiveness seen in National Team Members. They understand that having the opportunity to meet great athletes and coaches in person gives them a chance to watch their technique up close and ask questions that will enable them to drop in their races. They know every second counts. The top age groupers, their coaches and parents also use the opportunity to discuss workouts, strategy and other situational – and sometimes personal – situations. Destin Lasco not only swam one of the fastest times at Junior Nationals in prelims (43.78), he negative split it! His splits were 21.92 and 21.86. That time is amazing at any age, but he is only 16 years old! This swim star has a very bright future and we can’t wait to see what amazing feat he accomplishes next. NAG Record Holder Reece Whitley chose to skip Junior Nationals and instead competed at the NCAP Invitational swimming off events. Even though he wasn’t swimming his typical breaststroke and IM events, he still posted some really fast times including winning the 200 free and 100 fly. In preparation for college swimming, it is important to show recruiters your versatility! Take notes from Reece – He swims fast, and SMART! The video above is a perfect representation of how you are never too fast to learn something new. Kieran Smith has been a bright star in the sport for several years now, and he has recently committed to swim for the University of Florida next year! At Junior Nationals, Kieran won the 400 IM and placed second in the 200 IM and 500 free in a tough double. Kieran is going to be fun to watch as he begins his college career next fall! Many Fitter and Faster participants have gone on to win National Championships, World Championships Medals, and even Olympic Gold Medals! 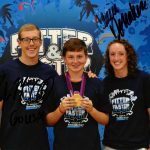 Give your swimmers the opportunity to relate to and learn from some of the world’s best by requesting a clinic with your team.